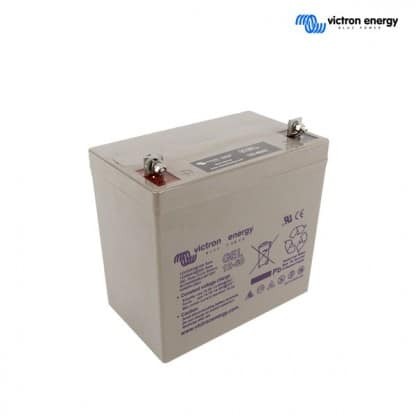 The Victron 12V 66Ah Gel Deep Cycle Battery is the perfect solution to store energy in stand-alone solar systems. In these batteries the electrolyte is immobilized as gel. Gel batteries in general have a longer service life and better cycle capacity than AGM batteries. These batteries can therefore be stored for a long time without recharging, if kept under cool conditions. Victron Energy B.V. designs and sells power solutions for automotive, industrial, marine, mobility, off-grid, and telecom markets. Its products include inverters, chargers, inverter/chargers, isolation transformers, autotransformers, battery monitors, batteries, panels and system monitoring products, DC distribution systems, transfer switches, cables, battery isolators and combiners, DC/DC converters, battery protection products, multipower products, solar products, solar charge controllers, and solar inverters and panels. The company sells products through distributors in the Netherlands and internationally. The Company was founded in 1975 and is based in Almere Haven, the Netherlands. Join our ZERO Home Bills Community. The BEST Products from the BEST Brands at BEST Prices for ZERO Home Bills on ZEROhomebills.com by Solaranna.